About: Jérôme Mesnager was born in 1961 in Colmar, in the Alsace region of northeastern France. He attended École Boulle – a school of fine arts&crafts – and in 1974, he got his degree in cabinetmaking course. For a while, he was teaching this craft at Boulle and in 1979, he started transitioning towards urban art. In 1982, gravitating fast to his current artistic expression, Mesnager co-founded a Zig-Zag, a group of young artists, eager to occupy streets and abandoned factories with their graffiti and performances, so their voice could be heard. On 16 January 1983 the White Man (sometimes translated as The White Body) was born, changing this artist’s life forever. Since that moment, Jérôme is on a mission, conducting it all around the world. The mission consists of spreading the happiness and peace through drawings of the White Man. In time, this silhouette became widely known as a symbol of positive living and the happiness of being free. One of Mesnager’s most interesting project is the great mural done in 1995, in the Ménilmontant Street in Paris and titled “C’est nous les gars de Ménilmontant”, a neighborhood in the 20th district of Paris, known to locals as Ménilmuche. This artwork is a homage to Matisse’s piece “La Danse”. In 2007 Mesnager was invited to paint the White Man in the Hotel Des Academies Et Des Arts in Paris, inhabiting 20 hotel bedrooms, some communal areas and a giant exterior wall of the fifth floor. Where you can see it: Jérôme Mesnager has painted walls all over the world, from Paris to the Chinese wall. Another interesting location the White Man found himself at, are the famous Parisian catacombs, in its off-limits area, closed but regularly invaded by the urban cavers called cataphylls. 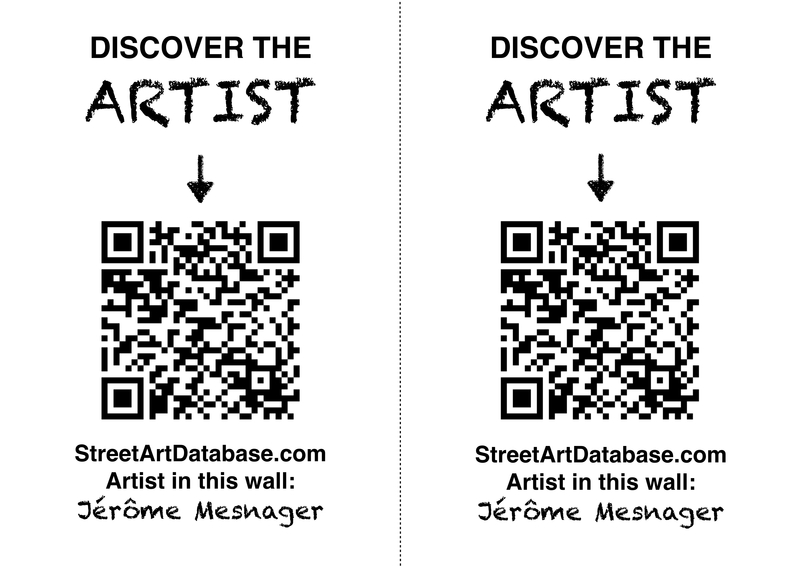 PRINT CODE: help tagging Jérôme Mesnager in the streets of your city! Posted in muralsBookmark the permalink.